Cover Story: The Great Southwest Kite Camp Caravan by George Peters, cover photo by Pierre Fabre of his own giant Playsail. 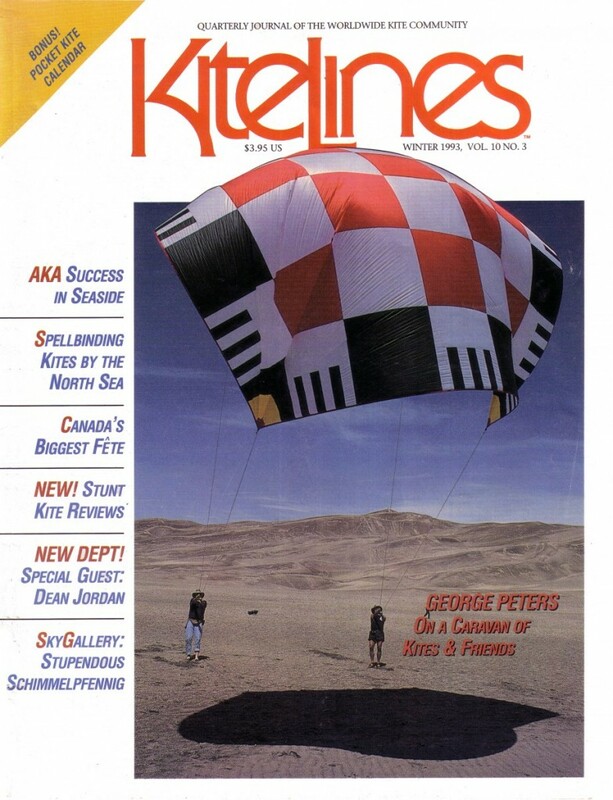 Features: Spellbinding kites by the North Sea, text by Kari Cress and Mel Govig, photos by Kari Cress, plus Fanø by Peter Whitehead; the AKA convention in Seaside, OR by Valerie Govig; the Rendez-Vous Mondial du CerfVolant in Verdun. Canada, by Anne Sloboda. Departments: Letter from the Publisher: on the perfect kite day; Design Workshop: a family of butterflies by Peter Sheragy; What’s New: Kites: the Falcon by Falcon Aero, the X-Minus-1 by Jordan Air, the I.Q. by Legend, the Spirit by Omega, the Cody by Optikites, the Eagle by Bird Kite Co.; What’s New: Books: CerfsVolants: A la Recherche du Bleu (Kites: In Search of the Blue) by Clément. Leistungsstarke Lenkdrachen zum Nachbauen (High Performance Stunt Kites to Make) by Rieleit, Ski the Beach by Rogers, Kites to Touch the Sky by Hosking, …und sie fliegen neute noch… Band 2 (..and they still fly today … Volume 2) by Snoek, Skywork 11 Experience by Schertel, Lenkdrachen (Stunt Kites) by Baxmeier, Aquiloni (Kites) basic booklets by Accascina; It Works for Me: rokkaku sparring by Fran Gramkowski and parafoil bridle storing by Ed and Bonnie Wright; Special Guest (new department): Dean Jordan on criteria for stunt kite design; Empty Spaces in the Sky: Peter Malinski remembered by Wolfgang Schimmelpfennig; For the Record: a quartet of debatable distinctions; SkyGallery: Wolfgang Schimmelpfennig kites, Schimmelpfennig photos. This entry was posted in Kite Lines, Out of Print. Bookmark the permalink.